Home » Website Building » Weebly » How to Share Weebly Blog Posts on Twitter? How to Share Weebly Blog Posts on Twitter? Weebly offers auto blog posts sharing option for Facebook and Twitter. We would say the process is semi-automatic since you need to click the share button manually after publishing the post. Being a popular microblogging platform Twitter is a one of the easy ways to drive social traffic to your Weebly site. In this article we will explain how to share Weebly blog posts on Twitter. You can see two sharing buttons – Facebook and Twitter. Just click on the Twitter button to enable sharing of blog article on Twitter. You will be prompted to login to your Twitter account, login with your credentials and authorize Weebly to tweet articles on your profile. Once the accounts are connected, you can enter custom message and share the blog post on Twitter. Later at any point of time you can revoke the Weebly access to your Twitter profile under “Settings > App” of your Twitter account. 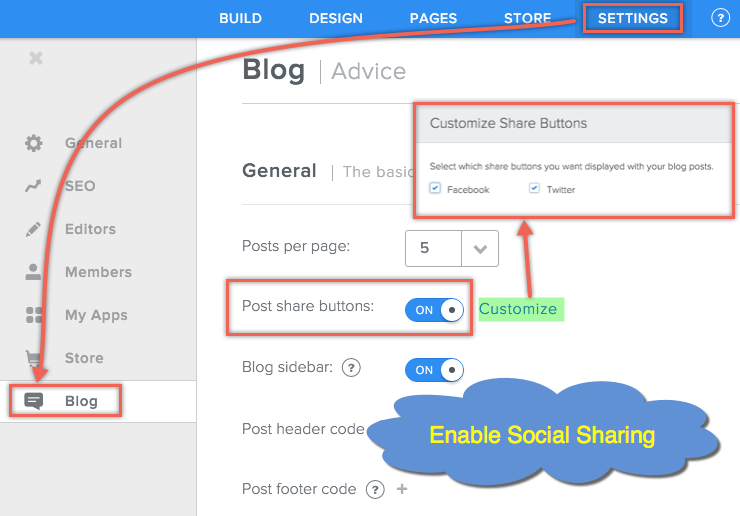 Unlike blog posts there is no option in Weebly for sharing standard or product pages. Whenever a page is published the popup will continue to show only the home page link and clicking on the sharing button will share the home page instead of the page you have published. 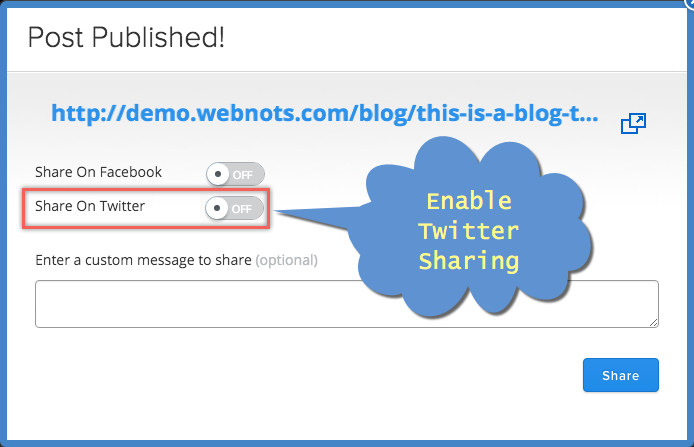 We hope Weebly will enable this option to share the pages on social platforms like Twitter. At this moment you need to either copy paste the URL or use any third party social widgets like AddThis or ShareThis for sharing your pages on social networks. Under each blog post there will be a Twitter icon showing the sharing count. If you are not seeing Twitter icon there, enable it under “Settings > Blog” and ensure whenever the article is shared the counter is increased accordingly. Twitter cards help to control the way the shared article is displayed on a Twitter profile. Unfortunately Weebly does not have an integrated Twitter cards to control the look of your shared article. When you share the article by default it uses the 140 characters limit of Twitter without any image or video added to the tweet. Below is the Twitter card validator results showing that the Weebly URL can’t be previewed since it was not whitelisted – meaning not with the Twitter card meta tags.